It's thin and lightweight (for a gaming laptop), but its graphics power unfortunately follows suit. Most of the Lenovo Legion Y530’s ports are on the back edge of the laptop. 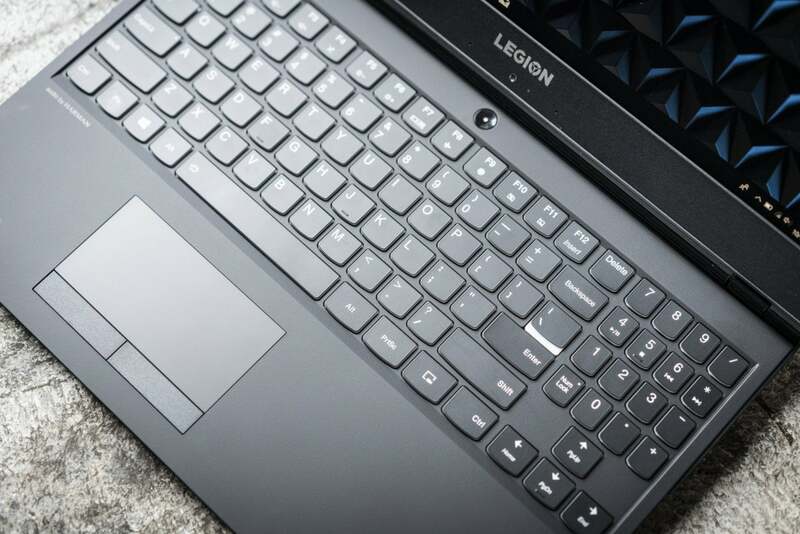 The bargain-priced Lenovo Legion Y530 weighs less than five pounds and measures less than an inch thick—impressively portable for a gaming laptop. It packs impressive quad-core multitasking performance, a comfortable keyboard, a reasonably bright screen and solid battery life. Unfortunately, the Legion Y530’s middling graphics card struggles to deliver buttery visuals from today’s AAA games, and its performance will only go downhill as more demanding titles come down the pike. We reviewed the cheapest version of the Lenovo Legion Y530 (81FV0013US), which comes with a quad-core Intel Coffee Lake Core i5-8300H processor, 8GB of RAM, and a 256GB solid-state drive. This CPU’s eight threads of processing power (thanks to Intel’s hyperthreading technology) promises plenty of multitasking, perfect for gamers who want to stream or create content while they play. Because it lacks a larger secondary drive, however, the Y530 doesn’t have enough storage for more than one or two top-tier games at a time. When it comes to visuals, the Legion Y530 boasts a 15.6-inch full-HD (1920x1080) non-touch IPS display, plus discrete Nvidia GeForce GTX 1050 graphics with 4GB of dedicated GDDR5 RAM. Sitting on the lower end of Nvidia’s GeForce 10 Series laptop graphics cards, the GTX 1050 generally falls short of buttery 60-fps gaming visuals at maxed-out video presets. You can often make up the difference by tinkering with your graphics settings, but we feel that a more powerful GTX 1060 graphics card—or at the very least, GTX 1050 Ti graphics—offers better value, as well as more headroom for the future. Lenovo offers a series of upgrades that’ll boost the Legion Y530’s processing power, storage and graphics. The top-of-the-line model boasts a hex-core Core i7-8750H CPU, 16GB of RAM, a 128GB SSD, and a 1TB hard drive, plus a GTX 1050 Ti graphics card, for about $300 more. That’s enough storage for a much bigger library of games, and enough imaging power to nudge gaming performance closer to the 60-fps mark. While you can certainly find cheaper gaming laptops with superior graphics chops (the recent GTX 1050 Ti-powered Dell G3 15 comes to mind), you’d be hard pressed to find one that weighs less than five pounds. Indeed, the 4.87-pound Lenovo Legion Y530 (compared to 5.36 pounds for the Dell G3) is by far one of the cheapest recent gaming laptops we’ve seen in its sub-five-pound weight class. The Legion logo is stamped into the lid of the Legion Y530. Measuring 14.4 x 10.2 x 0.95 inches and (as we just noted) weighing in at 4.87 pounds, the Lenovo Y530 feels relatively slim and trim for a gaming laptop. 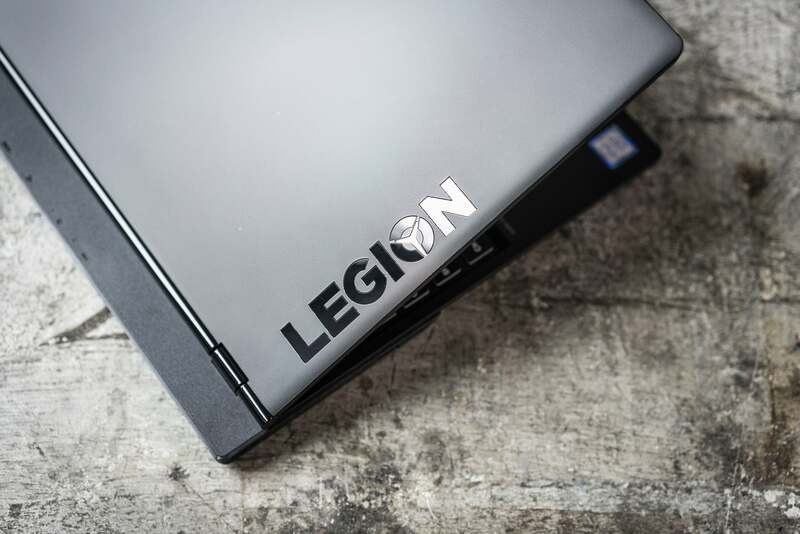 At first blush, the laptop’s onyx-black design makes it look like a generic business machine, although the glowing Legion ‘Y’ logo on the side of the finely etched lid sets it apart. 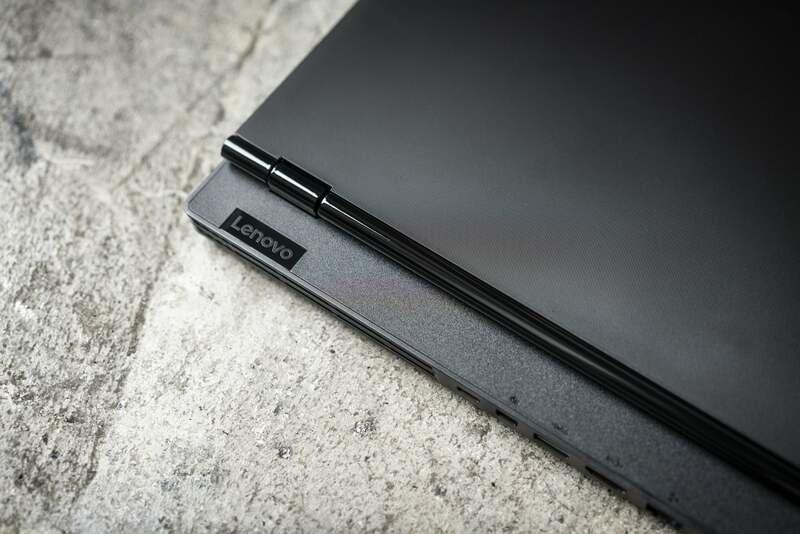 The Lenovo Legion Y530 has a shiny black hinge that sits about an inch forward from the back of the machine. 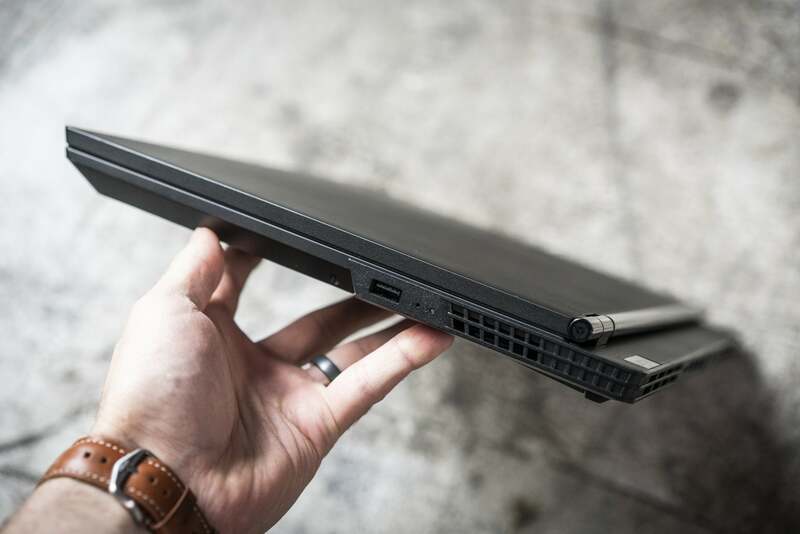 The hinge of the Legion Y530’s lid sits about an inch forward from the laptop’s back edge, which makes the slim rear end of the system look like it’s jutting out from the rest of the chassis—a nifty, console-like design choice that makes the Legion Y530 feel thinner than it actually is. 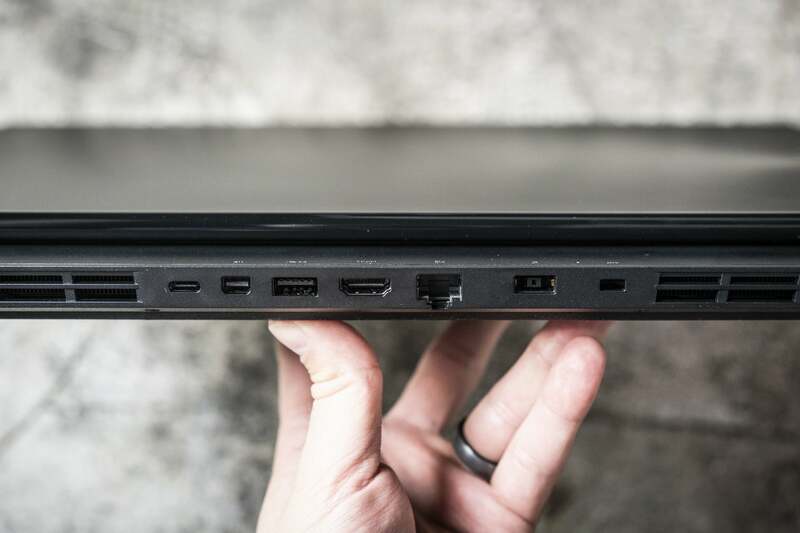 Speaking of the Legion Y530’s back side, several of the laptop’s key ports are rear-facing, including the power input, HDMI, USB-C and ethernet. (We’ll delve into the specific ports later in the review.) On the one hand, this location makes it easier to hide cables from view, but it also makes those ports harder to access. Opening the Y530’s lid reveals the 15.6-inch IPS display surrounded by thin bezels (about 8 mm) on the top and sides. It looks about as sharp and vivid as those on other budget gaming laptops we’ve tested. Viewing angles were solid, dimming slightly starting at about 45 degrees or so with no inverse colors as you might see on cheaper displays. Brightness on the Y530’s display measured about 280 nits (or candelas) according to our measurements, a little above our minimum 250-nit standard for comfortable indoor viewing. We prefer to see brightness readers of 300 or above on gaming laptops, but 280 nits isn’t bad given the Lenovo Y530’s budget price tag. The Legion Y530's keyboard includes a 10-key numeric keypad. The trackpad has discret mouse buttons. The Lenovo Y530’s full-size keyboard feels comfortable and snappy, complete with two-step backlighting (sorry, no flashy LEDs), a generous 1.7mm of travel, slightly concave key caps, a tactile bump in the middle of each keystroke, and a springy, refreshing rebound. A 10-key numeric keypad sits to the right of the main keyboard, with a roomy set of arrow keys just beneath. The Y530’s mid-size trackpad sits directly beneath the space bar, meaning it’s somewhat left of center to make room for the numeric keypad. While the trackpad lacks a physical clicking mechanism, you can still tap it to click, or you can click the two mouse buttons along the bottom of the trackpad. While the trackpad itself is smooth, responsive, and adept at rejecting mistaken inputs, it’s also quite the magnet for oily fingerprint smudges. The down-firing Harman Kardon speakers sound pretty good as far as laptop speakers go. Music sounds crisp and detailed, although bass is (per usual) on the weak side, and dynamics sound compressed whenever tunes reach a crescendo. Still, you can crank the Legion Y530’s speakers nice and loud, perfect for drowning out the laptop’s cooling fans (which never roar too loudly, even during intense gameplay moments). Solid though they are, the Legion Y530’s speakers are no match for a good pair of gaming headphones. The Legion Y530’s 720p webcam captures average-looking video—that is, a little grainy and blotchy but bolstered by reasonably vivid color and contrast. Serious Twitch broadcasters will, of course, be better off with a dedicated webcam. It’s also worth noting that the webcam lens sits in the bottom bezel of the screen, which means your Skype partners will think you’re gazing over their heads even when you’re looking them in the eye. The Lenovo Y530 offers a solid selection of ports, but as we mentioned above, the placement of the Y530’s ports—most in back—could be either or boon or a burden, depending on how you prefer running your cables. A single USB-A port sits on the right side of the Lenovo Legion Y530. Starting in back, you get a USB 3.0 Type-C port, Mini DisplayPort 1.4, the first of three USB 3.1 Type-A ports, a full-size HDMI 2.0 port, and ethernet RJ-45. Also in back: a rectangular power input, plus a Kensington Lock slot. On the left side, you get just two ports: USB 3.1 Type-A (second of three), plus a combo audio jack. Last but not least, a third USB 3.1 Type-A port sits on the right. Missing in action: Thunderbolt 3 (unsurprising for an entry-level gaming laptop) and an SD memory card slot (a little more disappointing). While the Lenovo Legion Y530’s gaming performance is held back by its so-so GTX 1050 graphics card, the laptop’s overall computing and multitasking performance gets a big boost thanks to its Coffee Lake Core i5-8300H processor. We’ve compared it to other lower-priced gaming laptops we’ve tested recently, but we’ve also made sure to show a range of GTX graphics so you can weight performance vs. cost. In our first benchmark, we use the free Handbrake tool to encode a 40GB video file into an Android tablet-compatible format. It’s a lengthy CPU-intensive test designed to tell us how a given laptop deals with spiking processor temperatures over a relatively long period of time—sometimes an hour or more, depending on a system’s horsepower. The Lenovo Y530’s Handbrake score gets a big boost thanks to its quad-core, eight-thread Coffee Lake i5 CPU. 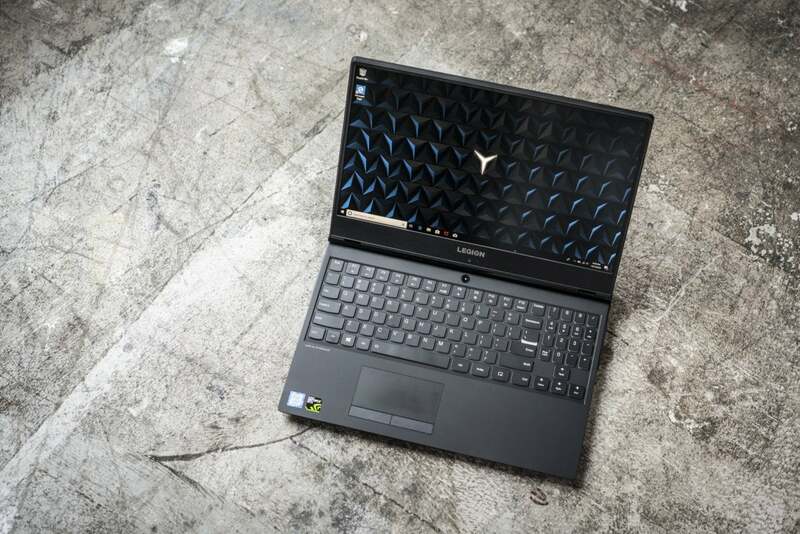 Laptops with the most cores and threads usually do the best with HandBrake, and the quad-core, eight-thread Lenovo Legion Y530 doesn’t disappoint. 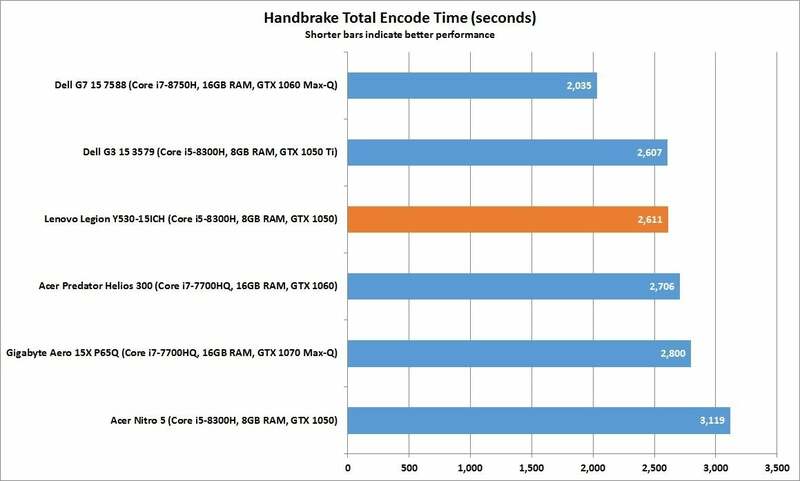 Its Handbrake score sits near the top, right in the mix with other i5-8300H-powered laptops and ahead of two 7th-gen Core i7 systems. Twitch broadcasters, content creators, or anyone else looking to multitask while gaming will get plenty of support from this CPU. One interesting observation about the Legion Y530’s HandBrake performance: Unlike other systems that dial down processor speeds and wattage during the Handbrake test, the Y530 keeps CPU package max-core frequencies cranked at about 3.64GHz, with processor package temperatures hovering around 94 degrees Celsius and thermal throttling continually enabled. Yes, it’s a bit like having a roaring fire in your fireplace while the air conditioner is on full blast, but it seems to work, with no hot spots on the laptop chassis or the keyboard. Next up is Cinebench, a benchmark that checks how a laptop performs under a brief period of stressful CPU activity—in this case, rendering a 3D image in real time. While our HandBrake benchmark takes about an hour to complete, Cinebench is often over in a matter of minutes. Despite the differing lengths of each test, both Cinebench and Handbrake reward processors with the most cores and threads. 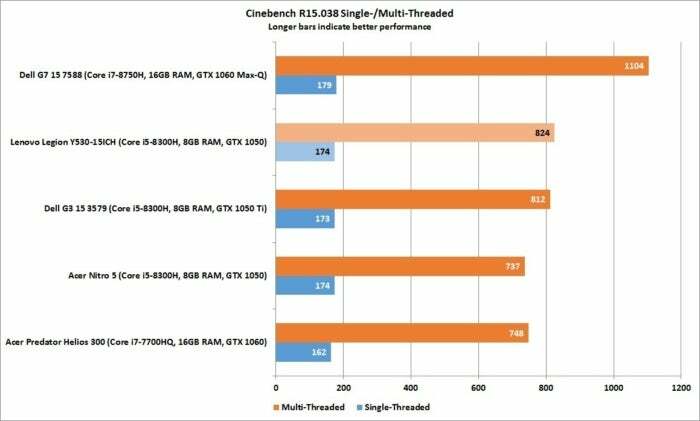 Only the hex-core Dell G7 15 was able to beat the Lenovo Y530’s Cinebench score. Not surprisingly the race was close when only a single thread was tested—meaning performance on mainstream applications should be solid on any of these CPUs. When we switch to multi-threaded testing, the higher-end CPUs tend to pull ahead. The quad-core, eight-thread Legion Y530’s score is bested only by the Dell G7 15 and its hex-core Core i7-8750H CPU. Gaming performance is important, and you can see if you keep reading.